On this dreary and cool Memorial Day 2013, it just doesn’t seem proper to get out the grill, cook some burgers, sit in the yard and enjoy this first “official” weekend of summer 2013. After all, the forecast calls for rain and the temperatures here in Chicago won’t budge much beyond 60 degrees. So let The PRude share some history, put forth a few thoughts about Memorial Day and recommend some songs to reflect on. 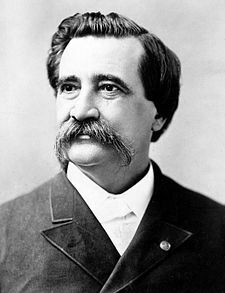 Not only was Gen. Logan a great man, he sported a way cool mustache. A Little History. A native son of Illinois is credited with the idea to recognize those brave Americans who fought and died for their country. I’m referring to John A. Logan, who commanded Union troops as a General during the Civil War and had a distinguished career in state and national politics. Here in my hometown, we’ve recognized Gen. Logan in two ways: By naming a neighborhood and Square after him, and through a monument in Grant Park. We live six blocks from the Logan Square roundabout, and I’ve blogged about the neighborhood, now one of the most desirable in Chicago. Believe me, it’s a special place to live and visit. As for the monument, which depicts the dashing General on a horse, it captured worldwide attention August 27, 1968 when protestors during the Democratic National Convention surrounded the statue and later clashed with Chicago Police. My Memorial Day Thoughts. Born in the 1950s, I grew up in the 1960s and had to register for the draft in the 1970s. In fact, I was among the last age groups of men that had to register for Selective Service while this nation still had troops fighting in Vietnam. I remember driving one day in September of 1973 to a Selective Service office with a friend from Illinois State University, Phil Walsh, to register at some office in Bloomington. We both shared the same birthday. Those years — the late 1960s to early 1970s — led to things ugly and beautiful for the nation. Ugly in the way our right to assemble turned violent here and elsewhere, largely over U.S. involvement in Vietnam. Beautiful in the way people of all races, creeds and colors banded together for what they thought was right. Ugly in the way returning Vietnam veterans were ostracized from much of society. Beautiful in the way those veterans — and our returning heroes from the current wars — are remembered today. Some Songs to Ponder. And now, as Memorial Day 2013 winds down, consider these musical selections. All were written around the time of the Vietnam War. All tell different sides of the war. I think all are poignant today. Please share your thoughts on Memorial Day. Or, at least take a moment to contemplate on the sacrifices made by the men and women of our armed forces. This entry was posted in Uncategorized and tagged Memorial Day, Vietnam War, war protestors. Bookmark the permalink.